Warner Robins, Ga – VIQTORY, a service-disabled, veteran-owned small business that connects the military community to civilian employment, recently named Central Georgia Technical College (CGTC) No. 8 among community colleges nationwide on its top Military Friendly® Schools list. The 2019-2020 Military Friendly® Schools list has come to set the standard for higher education institutions to provide the best opportunities for veterans and their spouses. This prestigious list provides a comprehensive guide for veterans and their families using data sources from federal agencies and proprietary survey information from participating organizations. VIQTORY shared news of the selection with the College in January and will publish the complete list in the May issue of G.I. Jobs magazine. The list can also be found at www.militaryfriendly.com. VIQTORY reports via a new release, those Institutions earning the Military Friendly ® School designation were evaluated using both public data sources and responses from a proprietary survey completed by the school. This year, 766 schools earned this prestigious designation. One of the ways CGTC serves veterans is through the Georgia Veterans Education Career Transition Resource (VECTR) Center. The Center offers educational coaching, career counseling, community resource assistance, resume assistance, and workforce training in partnership with Georgia’s academic institutions under the operation of CGTC. Currently, the Georgia VECTR center offers multiple onsite classes, serving more than 140 students over the past year. In addition, VECTR has provided over 29,000 military and veteran-related services at the Center. VIQTORY combines methodology, criteria, and weightings with input from the Military Friendly ® Advisory Council of independent leaders in the higher education and military recruitment community. Final ratings were determined by combining the institution’s survey scores with the assessment of the institution’s ability to meet thresholds for Student Retention, Graduation, Job Placement, Loan Repayment, Persistence (Degree Advancement or Transfer) and Loan Default Rates for all students and, specifically, for student veterans. The Military Friendly® Top 10 Schools are the guidon bearers for military/veteran programs and initiatives. They set the standard for other designations and are programs that continue to improve every year. 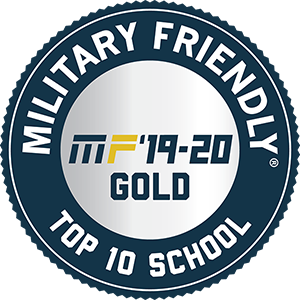 Photo: The 2019-2020 Military Friendly® Top-10 School logo.